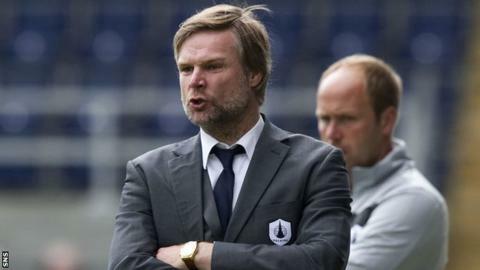 Falkirk boss Steven Pressley will next week hold talks with Dundee United over their upcoming managerial vacancy. But Ross County manager Derek Adams has ruled himself out of the running for the post. Free agents Derek McInnes, Billy Dodds and Partick Thistle manager Jackie McNamara have all been linked with a move to Tannadice. And Dodds confirmed he had been interviewed by United chairman Stephen Thompson and two club directors. "I think it's a great job," said BBC Scotland pundit and former Tangerines striker. "It would interest a lot of people. I was flattered to be invited up to do the interview. I face stiff competition. "I had a good chat with the directors." Last week with incumbent Peter Houston leaving in the summer. He played for United between 1995 and 1998, making over 100 appearances for the club. The Scotland defender joined Falkirk as a player in January 2009, becoming manager the following year.